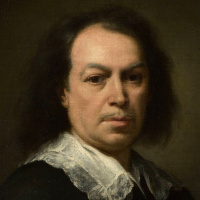 Bartolome Esteban Murillo (Spanish Bartolomé Esteban Murilloborn in late December 1617, baptized 1 January 1618, Sevilla – 3 April 1682, ibid) – the last of the great masters of the Golden age of Spanish art, master of religious and genre scenes, the head of the Seville school of painting. Features of works of Bartolome Esteban Murillo. The artist has the rare ability of the narrator, each presenting a picturesque plot as sort of an entertaining story while being a virtuoso of intricate decorative compositions. Murillo has repeatedly appealed to the image of the Madonna and like a true Sevillana, sang the bright beauty of women of native land (Madonna was considered the patron Saint of Seville and Andalusia, the land called "the land of the blessed virgin"). He has developed his own iconography of the "immaculate conception" and during his life wrote about 20 large paintings with this story, which made Murillo extremely popular in Europe. For example, according to the art historian Grigory Kozlov, all of the XIX century "Ascension Of The Virgin Mary" Murillo was the main star and "diva" of the Louvre, but then abruptly went out of fashion (so much so that the Louvre has agreed to transfer the painting in the Prado). Since then, the popularity of Murillo as a religious painter has subsided, but the undeniable artistic value retained his children's portraits are full of life unvarnished truth and optimism and made Murillo a forerunner of the emergence of realism. Famous Murillo paintings: "The little beggar (Lousy)", "Girl with fruit and flowers", "The rosary", "Isaac Blessing Jacob","Kitchen angels"
Seville painter Bartolome Esteban Murillo was the youngest of the three titans of contemporary Spanish painting of the SEVENTEENTH century Ribera, Velasquez and Zurbaran. His work completes the "Golden age" of Spanish art. Although Murillo never reached the technical perfection of Velasquez, and the majestic austerity of zurbarán or the eerie tragedy of Ribera, his humane and life-affirming Holy beggars were often eclipsed by the popularity of the picture predecessors. Birthday Murillo lost to history, known only that he was baptized January 1, 1618. His father, Gaspar Esteban was simple the Barber of Seville, and died when the youngest, 14-mu account, son of Bartolome Esteban was about 10 years old. The mother, Maria Perez-Murillo, passed away a year later. The future artist was brought up in wealthy Rodney, but his childhood and adolescence, little is known. Cosmopolitan Seville of the time of Murillo is not only a citadel of Catholicism, but real commercial site, a kind of "Spanish Babylon". Everyone traded there that could sell. The Italians carried the products of its manufactories and crafts. Colonized America were sending gold. The Genoese flow supplied to the slave market. Even savvy Seville bishops owned trading ships. What to do the young Murillo orphaned? From a distant cousin, the artist Juan del Castillohe got some fine skills. And when in 1639, the coach went to seek his fortune in Cadiz, gradually drawing from Seville the title of commercial capital, Esteban decided not to go under some experienced master, to soak him brush and clean the palette and start earning yourself. Was soon famous Seville fair extravaganza. Murillo had bought a large canvas, on which was written the scenes from the lives of the local saints. Then cut it into several parts and successfully sold the resulting small images with religious content "at retail". In the homeland of the Holy Inquisition that neither the Holy cult and monastic order under its umbrella to boot. Images of local saints were a hot commodity. Everyone wanted to bring home a "patron Saint". So later saints Rufina, Justin, Leander, Rodrigo, and others like them will bring Murillo stable income. In the early 1640s one of the prominent orders – Franciscan – ordered Murillo 11 giant (2 to 5 meters) compositions for their monastery. This work took about 3 years and at the end immediately made Murillo famous. The transition from total obscurity to high-profile fame was so striking that subsequently, the people of Seville put the legend of the voyage of the Madrid Murillo. It should also been an orphan, who had no regular art education, to understand their science? The rumor claimed that, save money, Murillo went to Madrid. There, at the court of king Philip IV, worked the famous Velasquez. He, too, was a native of Seville, and could not give the young fellow the permission to visit the Escorial and copied the great Italian and Northern masters. The legend says even more convincing that same day, when the Seville-born Murillo, velázquez in Madrid married is, he says, was a sign. While this story is plausible and would explain a lot in the evolution of the artist, there is not a single document, which would be its confirmed. Researchers are inclined to think that in fact, Murillo never left Seville. In his early work, starting with "Kitchen angels"where you will have created a literary-humorous plot, Murillo felt a natural storyteller. This will be his method – not just to write a gospel stage according to the canons, and filling it in vivid detail, stories of the relationships of the characters, some quite really household items. Some contemporaries of Murillo similar realism shocked. They would like a more reverent attitude to the Sacred history. While Murillo the carpenter Joseph is in the chips behind the workbench, Maria casually holding a needle ("The Holy family with the child St John the Baptist"), three years Jesus trains the dog ("The Holy family with a bird"), and travelers in "The adoration of the shepherds" jar the viewer with his wrinkled calloused feet. On the other hand, none of the Spaniards as much as Murillo, was not accused of reverse – smoothness and sweetness. Indeed, a number of his "Immaculate conceptions"suffers from mawkishness. Admittedly, assessment of creativity Murillo for three centuries ranged from enthusiastic apologetics to the humiliation – depending on your tastes. Career of Murillo in Seville, which he never wanted to leave, was excellent. Man he was calm, soft and friendly. Many local churches and monastic orders to deal with him was a pleasure. In Seville there was not a significant Cathedral, which could not boast of the work of Murillo. He was not yet forty when the Chapter (an ecclesiastical Council), Seville Cathedral elected him as the best artist in the city. Then ordered to write "The vision of St. Anthony of Padua" for a fantastic for those times the sum of 10 thousand reais. Murillo was a great organizer. In 1660, the year he created and headed the Seville Academy of fine arts – the most advanced and democratic of all occurred on the Iberian Peninsula in the 2nd half of the XVII century Sevillian artists did not depend on the tastes of the Royal court to Madrid, which gave more freedom of expression. Academy in Seville there was not at the expense of patrons, and the means of its members – it was a prototype of the Union. Even the Seville Academy first introduced the formal study of Nudes – to the Murillo did not have to study anatomy on the models, and the transfer of complex movements was always his weak point. However, after 4 years as a result of a power struggle with the head of the Academy was Juan de Valdes Lealand Murillo retired. In my personal life the artist suffered several tragedies. In 1645 he married doña Beatriz Sotomayor and Cabrera – his first and only sweetheart. His eldest daughter they named Mary – apparently, the glory of the virgin Mary, patroness of Seville, of which Murillo wrote incessantly (1,2,3,4) , but also in honor of his previously deceased mother, whose last name Murillo took instead of his father's (as well once received and Velasquez). Daughter of the artist was four years old, when in Seville the plague came. The epidemic destroyed half the city. Many monks changed its charitable activities on sanitary and collected and burned the bodies. Not survived and little Mary. Murillo suffered heavy the blow, but he was not the last. In early 1664, he lost his beloved wife, leaving the care of the artist's five children. After this Murillo moved from the mansion in a small annexe at the hospital of La Caridad, is closed, and for several years wrote nothing. His work after the crisis has gained a new quality – has developed a so-called "air style" Murillo. The figures in the paintings have ceased to be sharp and harsh, to soften their silhouettes were now enveloped in a pastel haze. Two main themes have glorified the artist's portraits of the destitute and the image of the virgin Mary in glory. It is known that English and French merchants in the ports prikalivatsja on the Guadalquivir river, the first thing asked "poor children" Murillo (1,2,3, 4), and all of the Spanish cathedrals were eager to decorate their altars dark Madonnas which Murillo wrote with black-eyed inhabitants of Andalusia. The huge popularity of Murillo among the widest layers of the population sets it apart from senior representatives of the "Golden age". Velasquez wrote for the aristocracy, and his innovative painting techniques can fully be evaluated only by experts. Murillo is in this sense more "simple" lyrical and accessible. It's a bit naive and devoid of tragedy Madonna and exciting the poor as well a clear and simple close to the heart of how simple the sermon of St. Francis. Murillo was killed in a tragic accident. Hardly the first time he had to leave his native city to paint the altarpiece at Cadiz. There, Murillo fell from the scaffolding and received incompatible with life injuries. However, before his death still managed to carry to Seville.